Load Transfer Stations – Columbia Machine, Inc. Some benefits of load transfer stations include eliminating injuries to the worker that are associated with heavy lifting and repetitive-motion, improving process and plant cleanliness and reducing costs. Load transfer stations are often utilized in industries such as food processing, warehousing, beverage, pharmaceutical, electronics, packaging, commercial, agricultural, cosmetics and medical. Typically used in manufacturing environments that require rapid pallet throughput, load transfer stations maintain critical work flow as well as helping to keep the warehouse floor space free of obstacles. Used for dispensing, collecting and accumulating loads of cases, bottles, glass vials, pails, combo boxes, bags or drums, load transfer systems are particularly useful for companies with a high pallet usage. 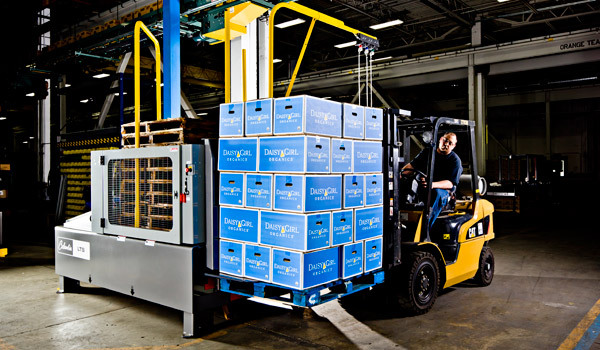 As a cost-effective alternative to load inverters, pallet transfer systems offer simple pallet transfer between pallet types and other load bases. The basic design of a load transfer station is typically operated by a fork lift driver and can be accessed from two sides for loading, or three sides for unloading. Even is this basic form, a load transfer station can offer extreme flexibility in terms of the number of type of processes that it can perform. However, in more complex pallet transfer system designs a pallet dispenser, a lift mechanism and an output roller conveyor can be added to the basic design for a fully automated load transfer system. A pallet dispenser is a device that is used to feed or dispense empty pallets to conveyors in larger palletizing systems or automatic palletizers. A roller conveyor is a type of material handling equipment that moves loads from one load base to another while using rollers that are placed parallel to one another to provide movement. A lift mechanism that a load transfer system could use would be a mechanical arm or an elevator plate that would raise the load up and away from the load base. An example of one method of pallet transfer would be when the load transfer station’s lift mechanism raises the load from the pallet, leaving room for the old pallet to be pushed away and a new pallet to be put in its place. Once the new pallet is in the place, the lifting mechanism will position the load onto the new pallet. Load Transfer Stations Load transfer stations are pallet transfer systems that transfer loads from one pallet to another pallet without disassembling. By efficiently moving loads from one type of load base, such as pallets, slip-sheets or floors, to another, load transfer stations simplify plant and warehouse applications such as shipping and other material handling processes.